How can you support Huguenot Heritage? If you haven’t watched our “Help us Plant an Orchard” video, please take a few minutes to do that here. 1. Support Huguenot Heritage financially. Huguenot Heritage needs funds to cover the expense of transforming the Third Millennium Curriculum into French. This is a very large project that will take several years, but the final result will be a very complete, Biblical education, for the world, for free. Please consider helping Huguenot Heritage arrive at this goal by supporting us financially. 2. Pray for us. We covet your prayers while we undergo this great task. Pray for good translators, pray for Francis as he networks with French churches, and pray that this education would equip pastors and result in many church plants! 3. 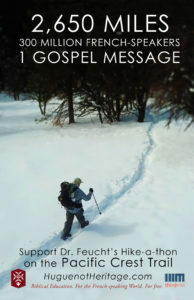 NEW: Support the Pacific Crest Trail Hike-a-thon by Dr. Kenneth Feucht. Donate per mile – 100% of proceeds go towards the production of Third Millennium Ministries courses into French! 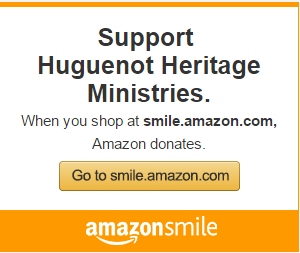 Huguenot Heritage is a 501(c)(3), tax-deductible organization. Pingback: Help Us Plant an Orchard!